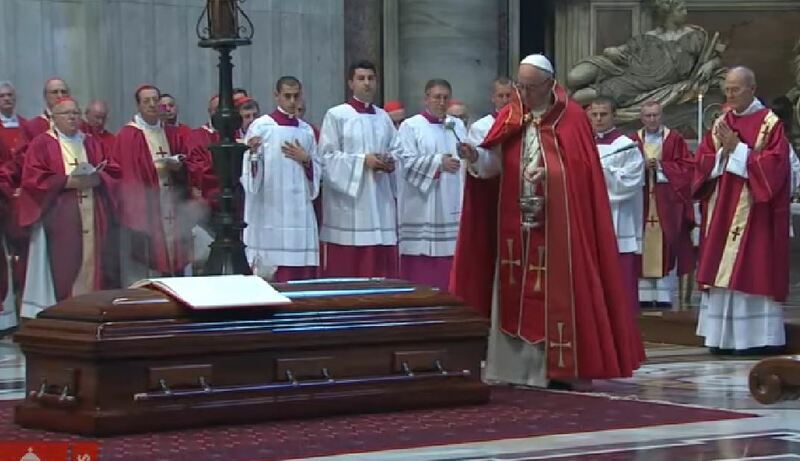 Cardinal Angelo Sodano paid tribute to “the unforgettable” Cardinal Jean-Louis Tauran and his “great apostolic spirit” by celebrating his funeral mass on July 12, 2018, in St. Peter’s Basilica. The French cardinal devoted himself to dialogue with all men of good will, he said. At the end of the liturgy, Pope Francis presided over the rite of “Ultima Commendatio” and “Valedictio”. Cardinal Tauran was President of the Pontifical Council for Inter-Religious Dialogue. He died on the evening of July 5, 2018, in the United States, at the age of 75. His death was announced by Vatican media the following day. The French cardinal was described as a “craftsman” by the Vatican media announced the following day, which described him as a “craftsman of the interreligious dialogue.” He was a close collaborator of three Popes, crossing across the world at the service of Vatican diplomacy. Suffering from Parkinson’s disease, the Bordeaux Cardinal was resting for a few days in a Community of Franciscan Sisters in Connecticut, in the United States. “Gentle and of extreme humility, much appreciated for his talents as a diplomat and his ability to listen,” adds Vatican News, “as Proto-Deacon Cardinal Tauran announced the election of Pope Francis on March 13, 2013 ‘Habemus Papam.’” Born in 1943, he was ordained a priest in 1969 and was called to Rome in 1973 to enter the Holy See’s diplomatic service in 1975. He attended the Ecclesiastical Academy, namely, “the School” of Vatican diplomacy, and the Pontifical Gregorian University, where he obtained a doctorate in Canon Law. He carried out his ministry at the Nunciature of Santo Domingo (19750-1979) and later in Lebanon (1979-1983). He then worked in Rome at the “Church’s Council of Public Affairs.” In 1990, he was appointed Archbishop and became the Secretary of that Council, which then took the name Section for Relations with States of the State Secretariat. John Paul II consecrated him Bishop in January 1991, and he remained for 13 years in the post of “Minister of Foreign Affairs,” carrying out numerous missions and leading numerous Holy See delegations in international conferences. In 2003, the Polish Pope created him Cardinal during the Consistory of October 21, 2003, and appointed him Archivist Librarian of the Holy Roman Church, where he got underway the programs of the anticipated opening of certain archives and the restoration of buildings. Because of this, the Library remained closed for three years. In 2007 Benedict XVI entrusted to him the presidency of the Pontifical Council for Inter-Religious Dialogue, a “delicate mission at the center of the geopolitical chessboard,” notes Vatican News. In this post, the Cardinal crisscrossed the world: Pakistan, Iran, Jordan, Azerbaijan, the Ivory Coast, Algeria, Benin, Nigeria, India, Korea, Bangladesh . . . he organized the first Catholic-Muslim summit in September 2008 at in Rome. He also worked for the rapprochement between the Vatican and Al-Azar University (Egypt), the highest authority of Sunnite Islam. More recently, from April 13-20 of this year, the President of the Dicastery was in Saudi Arabia, where he met with Sheik Muhammad Abdul Karim Al-Issa, Secretary-General of the Muslim World League, and Prince Mohammed bin Abdurrahman bin Abdulaziz, Deputy Governor of the capital. The Vatican and the Saudi Kingdom signed an agreement of cooperation on the occasion of the trip. Appointed Proto-Deacon Cardinal in 2011 by Benedict XVI, Cardinal Tauran was appointed Camerlengo by Pope Francis in 2014, putting him in charge of managing the Holy See’s affairs during a period of apostolic vacancy. After his death, the College of Cardinals now has 225 Cardinals, 124 are Electors and 101 Non-Electors.